Let’s say you are making a round-robin VFR flight; your plan is to leave in a couple of hours and return back home three days later. For the initial outbound leg, there’s a ton of weather guidance available to be sure you can make a safe VFR trip. This includes observational products such as ground-based radar (NEXRAD), satellite imagery, pilot weather reports and METARs, as well as forecasts such as prog charts, terminal forecasts (TAFs) and the area forecast (FA) along with AIRMET Sierra. But what about that return flight in three days? We’ll get to this trip a bit later. The low-level SIGWX, area forecast, and terminal forecasts are fine for anticipating the weather for the next day or so, but they simply don’t extend out far enough in the future to tell you if IFR conditions might mess with your plans three days down the road. Prog charts go out to seven days, but only depict areas of precipitation out to 48 hours and say nothing about ceilings nor visibility; however, don’t cast out the prog charts just yet. A widespread low IFR event ordinarily doesn’t happen without some kind of large-scale synoptic support. So prog charts can provide some important clues. To zero in on ceilings and visibility up to three days in advance, you’ll want to try a model-based forecast called GFS MOS (also known as the MAV). The GFS MOS ceiling and visibility forecast is available in ForeFlight Mobile’s USA Imagery collections. This forecast graphically depicts the expected ceiling and visibility over the next three days at three-hour forecast intervals for the conterminous U.S. Moreover, it’s refreshed every six hours. Model Output Statistics, or MOS, is derived from numerical weather prediction models that meteorologists use to issue their forecasts—in this case the Global Forecast System, or GFS. This model doesn’t automatically produce a point forecast for a specific town or airport. Combined with geoclimatic data, MOS takes the “raw” model forecast and attempts to improve on it by making a more useful site-specific forecast complete with weather elements critical to pilots, such as ceiling and visibility. MOS guidance can be displayed for specific airports, as seen in ForeFlight Mobile. However, to determine the widespread nature of the event, GFS MOS guidance can also be graphically contoured over a geographic area the size of the conterminous United States (shown below for ceiling height). Displaying the categorical ceiling height and/or visibility graphically in this way is perhaps the best approach to use MOS for extended guidance. The categorical GFS MOS forecast for ceiling. Legend is located at the bottom of the forecast. Before we go any further, let’s do a quick review. A ceiling is the lowest cloud layer aloft that is reported as broken or overcast. If the sky is totally obscured (hidden), the height of the vertical visibility will be the ceiling. Ceilings are represented as above ground level, not mean sea level. So the GFS MOS forecast for ceiling is showing height above the ground. But keep in mind that ceilings can vary widely over rugged terrain. This forecast is a close cousin of the MOS forecast available in ForeFlight Mobile. Unlike the area forecast and TAFs that offer an absolute ceiling and prevailing ground visibility forecast, the GFS MOS guidance is a categorical forecast. It uses flight categories to include Very Low IFR (VLIFR), Low IFR (LIFR), IFR, Marginal VFR (MVFR) and VFR. The color-coded legend that depicts these categories for the contours on the map is located at the bottom of each forecast as shown below. Areas depicted in black on the map are expected to be clear below 12,000 feet AGL. Legend that exists at the bottom of each GFS MOS ceiling forecast annotated with ceiling flight categories. Visibility is very similar. Keep in mind that this a forecast for prevailing ground visibility. Flight categories include VLIFR, LIFR, IFR, MVFR and VFR as well. Areas shown in black represent a visibility forecast greater than 6 statute miles. Legend that exists at the bottom of each GFS MOS visibility forecast annotated with visibility flight categories. Before using any forecast you must be certain how to decode the date-time stamp on the image. For the GFS MOS ceiling and visibility forecast, this is located in a banner across the top of each image like the one shown below. The date-time stamp is located on the second line of this banner. This forecast uses YYMMDD/HH as the format (annotated in white below). So in this example, the text 150828/1500 on the second line suggests the forecast is valid at 1500 UTC on August 28, 2015. The text at the end of the second line following “1500” or V075 is less important and simply states the forecast hour. In this case, it’s a 75 hour forecast—meaning that it’s a projection of what the ceiling (or visibility) will be in 75 hours from the time the GFS model was initialized. The GFS model is initialized four times daily at 0000, 0600, 1200 and 1800 UTC. Back to our round-robin flight. It’s Wednesday and the plan is to depart Oshkosh (KOSH), Wisconsin this afternoon headed to International Falls (KINL), Minnesota with a return to Oshkosh three days later on Saturday morning. After examining the TAFs, area forecast and pilot weather reports, the weather is looking excellent for today’s flight. The layers overlaid on the ForeFlight Mobile Map view below include the latest satellite, current ceilings and AIR/SIGMETs. The satellite image shows a some scattered clouds in the vicinity of Oshkosh, but clear skies all the way to International Falls. The ForeFlight Mobile Map view shows the latest satellite layer along with the AIR/SIGMETs and ceiling layers. Except for some scattered clouds in the Oshkosh area, no other weather concerns on the flight from KOSH to KINL. So the outbound flight this afternoon has no real weather implications for a VFR flight, but what about the return leg back to Oshkosh on Saturday morning? Most of the public forecasts are showing a 30% chance of showers on Saturday as shown below, but nothing in this forecast mentions ceilings or visibility. GFS MOS comes to the rescue! This 75-hour forecast below is valid at 1500 UTC on Saturday and clearly shows that a VFR flight back to Oshkosh isn’t very likely. During the morning, a good portion of the route from International Falls to Oshkosh includes ceilings below a VFR flight category. This GFS MOS categorical ceiling forecast valid at 1500 UTC on Saturday shows IFR conditions along the route. But the news isn’t all that bad. The weather is expected to improve in the afternoon as shown in this 81-hour forecast below valid at 2100 UTC on Saturday. The entire route is forecast to be clear below 12,000 feet. Of course, it would be important to also check the forecast visibility at this time. This GFS MOS categorical ceiling forecast valid at 2100 UTC on Saturday shows ceilings improve significantly with skies clear below 12,000 feet along most of the proposed route. The GFS MOS ceiling and visibility forecasts are located in the ForeFlight weather Imagery. On the iPad tap on Imagery and then tap on the USA button on the lower left. On the left menu bar you will see selections for Ceiling Forecast and Visibility Forecast under the GFS MOS label. Forecasts on the right begin at 6 hours and run through 84 hours for both ceiling and visibility. Check out the second half of this article series. GFS MOS forecasts in the ForeFlight weather imagery. 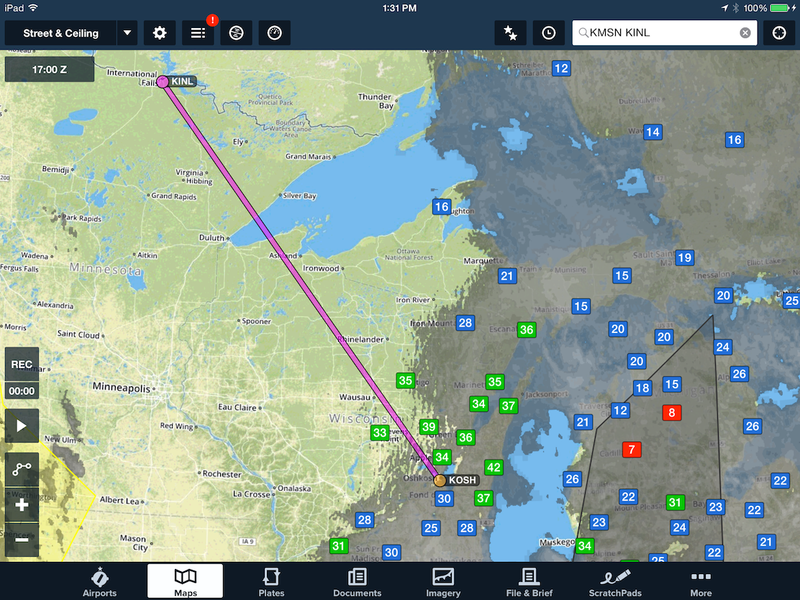 This entry was posted in Weather and tagged aviation weather, flight planning, foreflight, ForeFlight Mobile, Weather, weather forecast by Scott Dennstaedt. Bookmark the permalink.